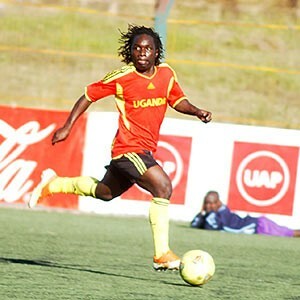 Daniel Sserunkuma featuring for Cranes in 2013. Courtesy photo..
FOOTBALL–After a troubled last few years former Kampala kids league graduate Daniel “Muzee” Sserunkuma has finally returned home with Express FC. “We are delighted to announce the signing of Dan Sserunkuma ” read a statement on both of the Club’s Twitter and Facebook accounts. The former Victors FC striker who was expected to complete a move to Morrocan club IR Tanger in April but is believed to have been denied an International transfer certificate(ITC) by FUFA has decided to settle where it all begun for him. It should be noted that Sserunkuma started his professional spell with the Wankulukuku based club in 2008 where he scored 10 goals from 18 matches before crossing to to Gor Mahia in Kenya. Muzee as he is commonly known has had a troubled last few years lately, failing to settle at one place ever since he moved from Kenyan premier league giants Gor Mahia in 2014 playing at Tanzanian side Simba, Ulisses of Amenia and then back to kenya with Bandari in the process. Sserunkukma is highly expected to be among the new players Express are set to unveil today and may also start playing on Wednesday as the 2012 league champions host Jinja based Kirinya JSS. The striker made his senior international debut for the Cranes against the Amavubi Stars of Rwanda on 6th February 2013 in Amahoro stadium where he scored scored via a penalty in the 68th minute in a 2-2 draw. Few years back, Micho once described Dan Sserunkuma as one of the best strikers in the region. 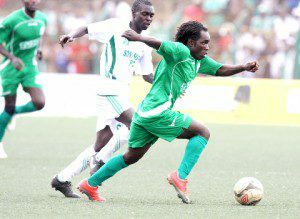 Daniel Sserunkuma in action for former club Gor Mahia. Courtesy photo. “He is definitely one of the best strikers we have in this region and seeing how he played today (Friday), I am happy with his performance,” Micho said, as quoted by Goal.com in 2013. “He (Sserunkuma) never had much time in the World Cup qualifiers or the Chan African Cup qualifiers for Uganda but I now assure him that with this kind of performance, he has won himself a starting place in the senior team.